CUSTOM CALLIGRAPHY CAN BE ADDED TO ONE OR BOTH SIDES ABOVE THE AXIS OF THE METAL STAND - CHOOSE OPTION OF YOUR CHOICE IN DROP-DOWN MENU. 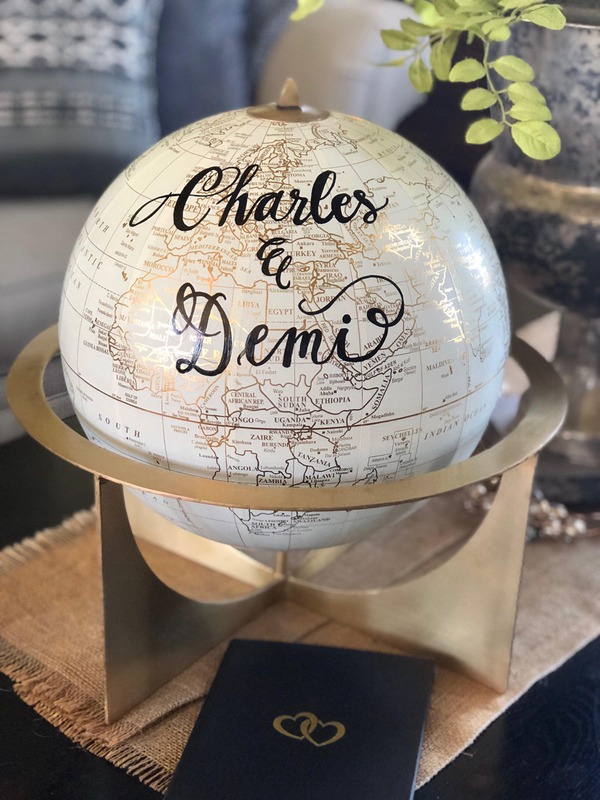 ***PLEASE NOTE THAT THIS LISTING IS FOR A LARGE GLOBE WITH STAND WITH CUSTOM CALLIGRAPHY. GLOBE NOT SOLD SEPARATELY. 🌿 INTERESTED IN A CUSTOM ORDER? MESSAGE ME! 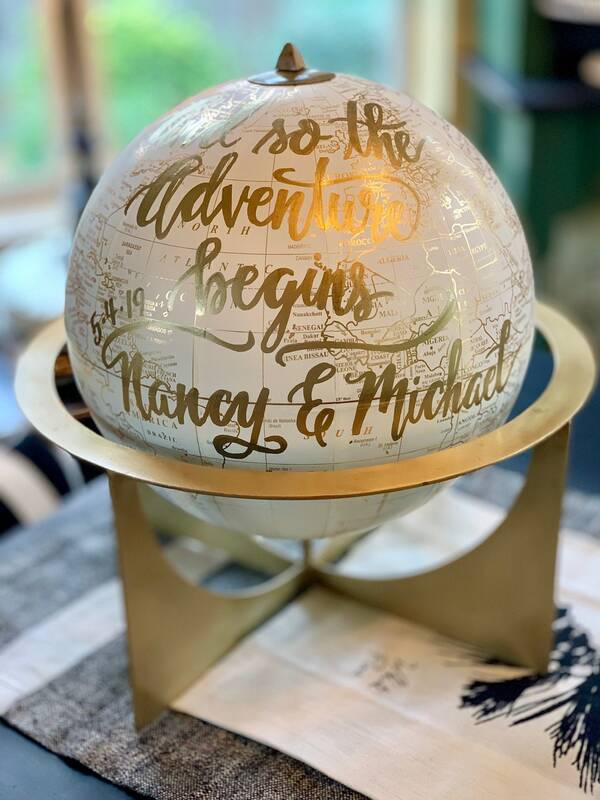 This beautiful white and gold globe on a modern-style metal gold-based stand is hand-lettered with your choice of metallic ink or black ink. 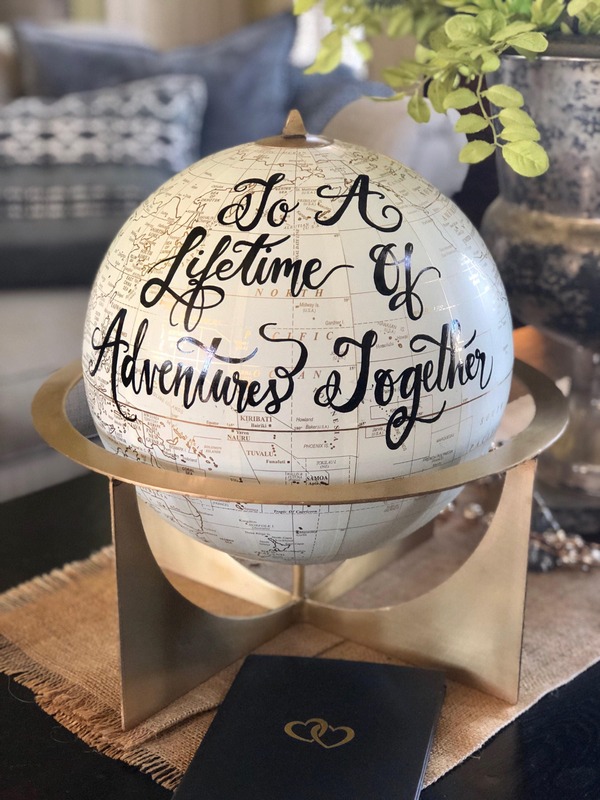 Message me if you are interested in having a customized globe with the quote or phrasing of your choice! (If you would like me to use a different color globe, message me this, as well, and we can discuss your preference and I will do my best to show you some options for ordering and will create a special custom listing just for you). NOTE: There may be slight metal indentions/imperfections in the base of the globe and slight color changes on the globe surface itself. These are not defects, but are part of the general vintage globe appearance. "You Are Our Greatest Adventure"
"You Are My Favorite Adventure"
"I Love You to the Moon & Back"
"Where You Go I Will Go,"
"You Make My World Go 'Round"
"Love Makes the World Go 'Round"
"Love Is the Greatest Adventure"
"And So the Adventure Begins"
"For God So Loved The World"
"Oh, Come, Let Us Adore Him!" "Let Earth Receive Her King!" "Spirit Lead Me Where My Trust is Without Borders"
"For God So Loved the World" (on other side - "Jesus - John 3:16"
"Go Into All the World & Preach the Good News to Everyone - Mark 16:15"
"Go Ye Into All the World.... - Mark 16;15"
"I Will Make You as a Light to the Nations - Isaiah 49:6"
"I Am With You Always...Even to the End of the World - Matthew 28:20"
"Wander Often - Wonder Always"
"Find Joy in the Journey"
"All Directions Point to Love"
"Say Yes to New Adventures"
"Live • Love • Travel"
"Live in the Sunshine, Swim the Sea, Drink the Wild Air. 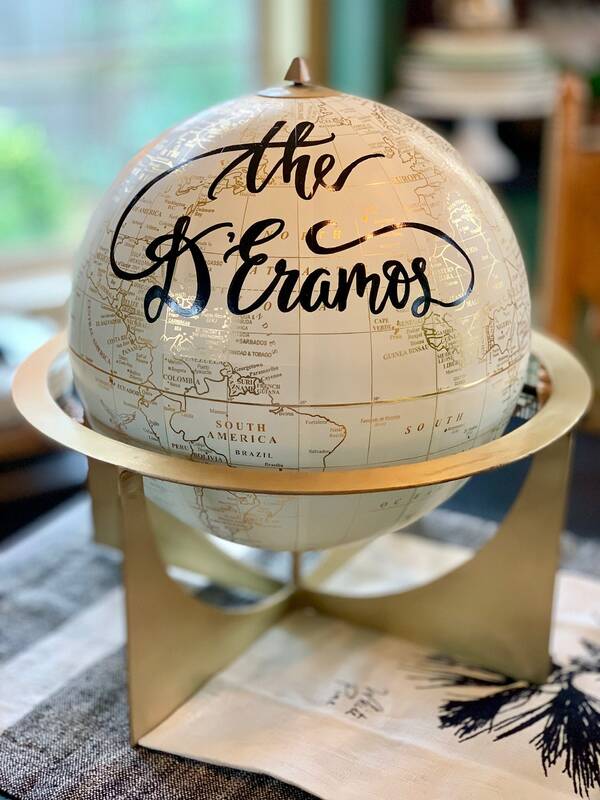 --Emerson"
"Live Simply • Dream Big • Be Grateful"
"Believe There Is Good In The World"
Your custom globe will be hand-lettered just for you and shipped in a bubble-wrapped box to protect its safe delivery to you. Please allow about 1-2 weeks for creation and delivery if globe is in stock. (Time may vary if globe is not in stock and must be ordered. An estimated timeframe will be given to you at the time of your order). 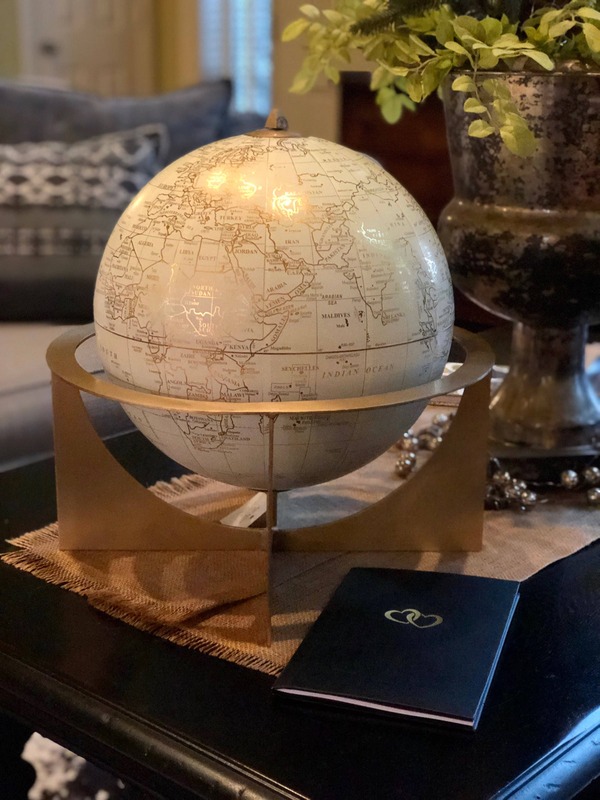 I look forward to working with you to create a globe that will become a treasured heirloom for you or someone you love! To fulfill your order, you must provide me with certain information (which you authorized Etsy to provide to me), such as your name, email address, postal address, payment information, and the details of the product that you’re ordering. 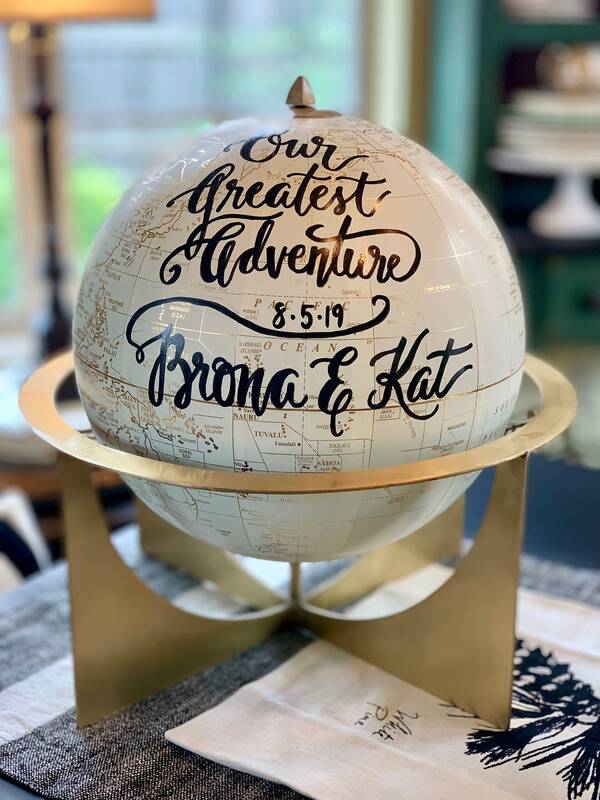 You may also choose to provide me with additional personal information (for a custom ordered globe design or other calligraphy or art print or floral mobile wreath, for example), if you contact me directly. * Service providers. I may engage certain trusted third parties to perform functions and provide services to my shop, such as delivery companies. I will share your personal information with these third parties, but only to the extent necessary to perform these services. * Object. You can object to (i) my processing of some of your information based on my legitimate interests and (ii) receiving marketing messages from me after providing your express consent to receive them. In such cases, I will delete your personal information unless I have compelling and legitimate grounds to continue using that information or if it is needed for legal reasons. Shelley L Krupa, c/o SelahGraceDesigns, 3702 Rouncival Dr., Longview, TX 75605 USA. What is the difference between the white and gold globe and the whitewashed globe? The globe for both is the same...when you choose “gold and white globe” it will be the creamy white globe with the gold countries showing. The whitewashed globe is the same gold and white globe with a thin creamy wash over it...this dims the countries down into the background. They can still be seen but they are no longer gold. 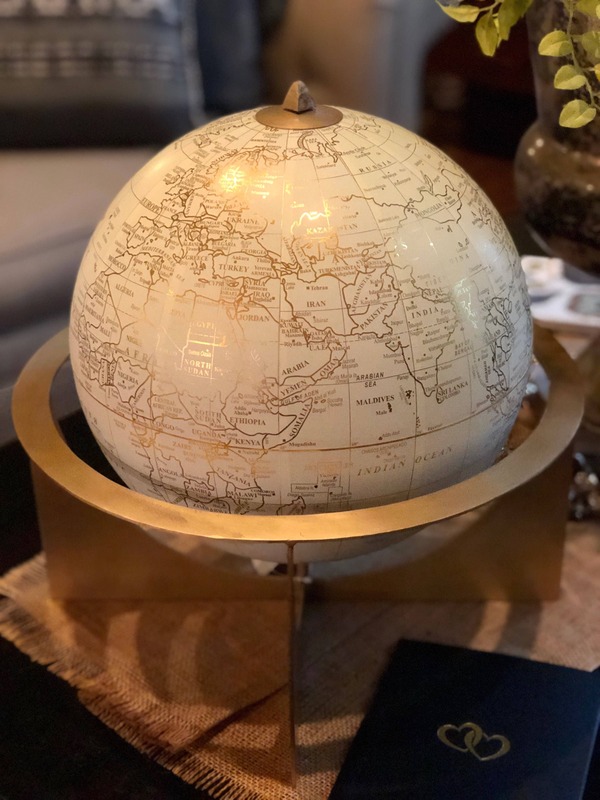 As you scroll through the listing photos, you will see examples of both the white and gold globe and the white and gold globe with the whitewash added. What kind of pen is best for adding signatures when using it as a guest globe? How many signatures will the medium-sized white and gold globe (and other globes of similar size/dimension hold? 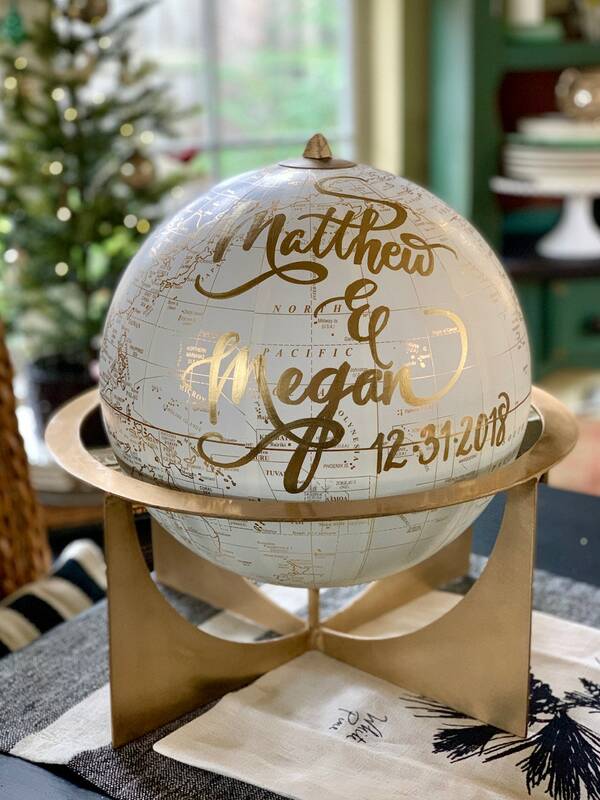 While I can’t say for sure how many signatures can go on the white and gold globe (it is medium-sized; 8.5-9” in diameter), most of my customers who purchase my globes are using them as a guestbook alternative. To help with the signing of the globe, I have been recommending that my customers use an ULTRA FINE LINE black Sharpie marker to sign the globe. The black signatures will show up better against the globe's calligraphy writing and on the washed globes and will also be fine enough to allow more room for signatures. Couples more than likely sign one signature (cutting down on signatures also)...think of it more like the amount of invitations you ordered rather than individual guests (like a regular guestbook would be signed). This box is not large enough for all the wonderful things I have to say. First, The seller is amazing to work with, super friendly, nice, patient, accommodating! Our globe came in absolutely beautiful and it was packaged with care!!!! We are so pleased and looking forward to having it on our big day. Thank you!!!!! 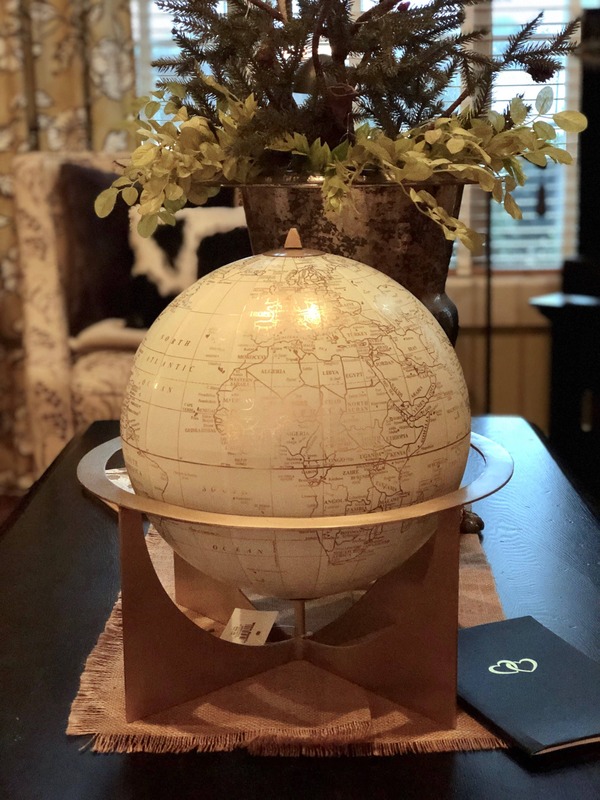 So pleased with the globe I ordered for my nieces wedding. Shelley was amazing to work with and went above and beyond to make sure I was satisfied. Advice: give yourself plenty of time. Shipping was very slow, but that certainly wasn’t her fault.